I am reminded that God gave me an idea from the book of Haggai, and, as I began to write … and listen … it turned into an eight-part series. It was only about “Three Words,” but God turned it into several pages, over many, many days. Looks like it will also turn into a new book in the future. I just can’t say enough, how important it is to listen to God, to put yourself into a position to be used by Him, for Him, and through Him. I am reminded of a Bible study I attended a few years ago. The Pastor was the speaker, and he began the lesson by describing the impact which a few words he heard, early in his life, had made on him. How a few words, from one speech he had listened to, had affected the way he looked at his life and purpose today, and in the future. How this one speech had affected not only him, but an entire generation of Americans. The speech was President Kennedy’s Inauguration Speech, which he had heard live, as a teenager. The words revolved around the “Ask not what this country can do for you” portion of the speech. You just never know who may be listening to what you say. Or, to what you write. I am also reminded of the power of words. Your words. My words. Words you say. Words I say. Words you write. Words I write. How much prayer goes into each? 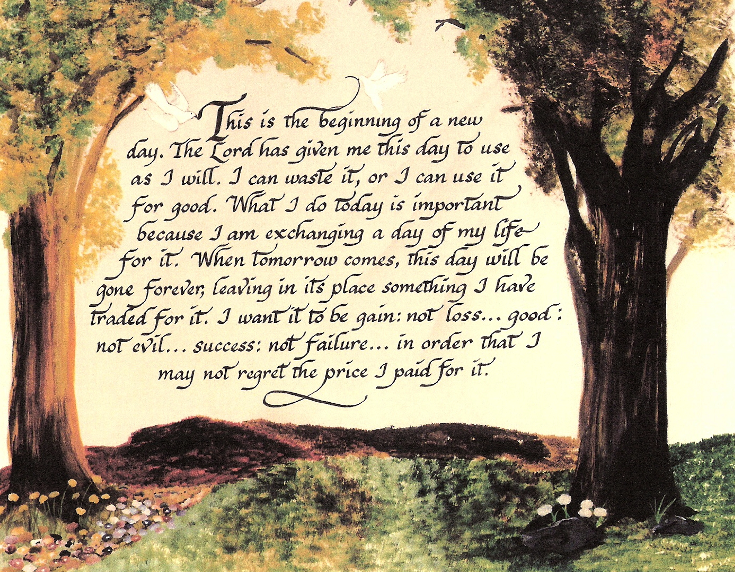 If we “Begin a New Day” the “right way,” then I like our chances for the rest of the day. Tagged begin the day, Christian art, Richard.Vincent.Rose., words for daily living.